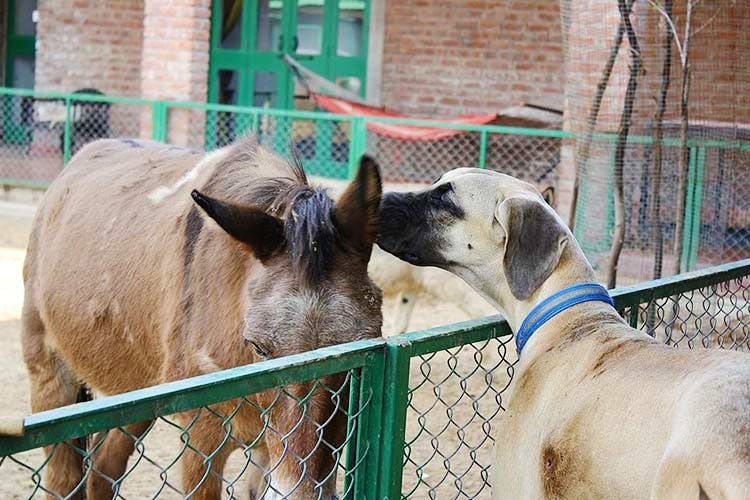 All Creatures Great And Small is an animal shelter on the Faridabad-Gurgaon road where you can spend quality time cuddling with some animals and helping out at the shelter. ACGS helps animals in distress, and gives them a home when no one else does. Along with the dogs (they have over 300 of them!) you will also see rescued donkeys, horses, mules, cats, cows and emus! There is constant aid needed to conserve and protect these animals. ACGS has excellent veterinary care services that are given individually to each animal. Apart from chilling at the farm, you can also spend a day helping out with feeding them, bathing them, cutting vegetables and cooking and indulging in some farming activities. Anjali Gopalan, the woman who’s taken such an awesome initiative, has spent her life taking care of these four-legged creatures. She encourages people to come forward and sustain this ever growing eco-system and keep the balance intact. You can get in touch with her and donate wisely towards her cause. You can also carry supplies (medicines/food etc.) for the animals at the farm. Definitely get out of the city and head to ACGS to spend a beautiful day helping out at the farm. ...that it's 1.5 hours away from the city. But, with hillocks and water bodies, this is an ideal place to shelter animals that need a home (so, it doesn't hurt to step out of our comfort zone).